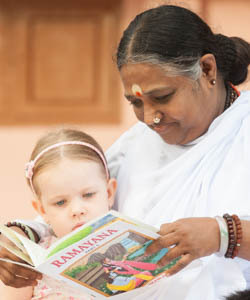 Amma’s teachings began with her birth itself. She entered this world in silence, a divine gesture worthy of our contemplation. 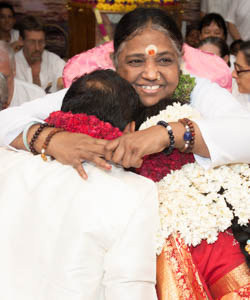 This has always been Amma’s way. 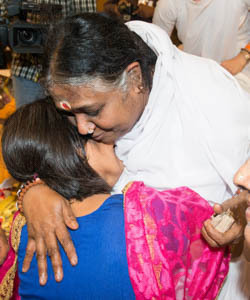 Throughout, Amma’s life has been her teaching. 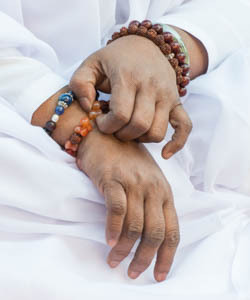 If we watch Amma, we will see the embodiment of all the divine qualities she is constantly encouraging us to cultivate. If you want to understand devotion, watch the tears as they roll down her cheeks during bhajans. If you want to learn about serving the world selflessly, sit by her side one evening as she embraces 12,000 people. If you have questions about sadhana, envision her years on the seashore when she sat motionless, completely estranged from the world. 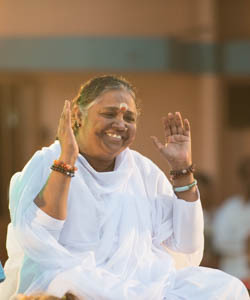 And whatever Amma does, it is meditation, whether sitting in silence, speaking to thousands or sweeping the ashram courtyard. 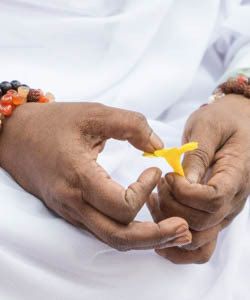 Amma teaches renunciation, but only in the midst of a lifetime of refusing to consider her own comfort. 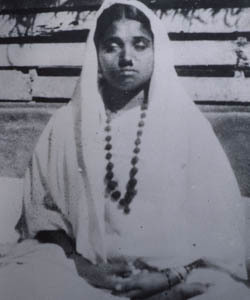 Amma teaches Advaita, but not without her every breath bearing testament to her inability to see any man, woman or child as different from her own Self. Indeed, actions speak louder than words. Yet the Truth as heard from Amma’s lips has deafening impact. 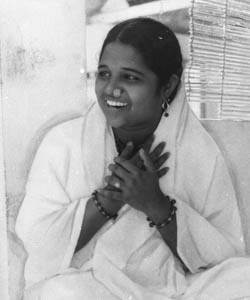 Whether delivered to crowds of thousands or in the intimate setting of the ashram, Amma’s satsang is always unforgettable. 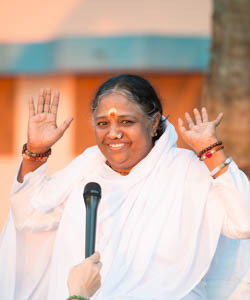 Amma is eternally established in Truth, which is beyond words, beyond thoughts. Perhaps this is what she was trying to impart to us through her birth. Yet when she wants to convey that silence, it assumes the form of a thought. A collection of these thoughts is presented here, so that one day we too may realize that silence.